LIHUE >> An Idaho company that specializes in running hydroelectric power plants has applied for a federal permit to explore the possibility of building a dam on the Wailua River. 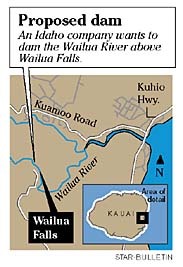 The proposal envisions a dam above Wailua Falls -- the twin waterfalls that are a Kauai tourism icon -- connected by a pipeline 8 feet in diameter and nearly a mile long to twin power plants below the falls. Kauai is the only one of the Hawaiian Islands with navigable waterways, and the Wailua is its largest river. "Oh, this should be really interesting," said Kauai Planning Director Dee Crowell. The last attempt to build a hydroelectric plant on the Wailua was in the late 1980s by a Utah-based company called Island Power Inc. It was protested at every step in the lengthy permitting process by environmentalists concerned about the affect on the river. "It took so long that by the time they got to applying for their final permits, the initial permits already were expiring," Crowell said. The plan ultimately was killed by the Kauai Planning Commission, although not because of environmental issues. "It was a very shoddy proposal," said Barbara Robeson, a Kauai Planning Commission member at the time. "They kept giving us incorrect information." Robeson said many people on Kauai favor hydroelectric power in theory, but when it comes to diverting the flow in any particular river, they are opposed. Similar proposals involving the Hanalei River and Lumahai Stream also met opposition in the late 1980s, and both died. "All of those hydroelectric permit applications were what got me into politics," said State Rep. Mina Morita, (D, E. Maui-N. Kauai), who also was a member of the Kauai Planning Commission at that time. Although she is a champion of renewable energy, she is opposed to hydroelectric power. Kauai has only two small hydroelectric plants, both built in the 1920s. Every new plant proposed since then has been killed somewhere in the permitting process. The latest permit application was filed by Symbiotics LLC, a new consortium formed by two existing firms: Northwest Power Services of Rigby, Idaho, and Ecosystem Research Institute of Logan, Utah. Brent Smith, president of Northwest Power Services, said in a telephone interview earlier this week that the permit filed with the Federal Energy Regulatory Commission is only to conduct a feasibility study. He said the consortium this year filed 130 permit applications. The one on Kauai is the only one outside the Pacific Northwest. The Wailua River proposal calls for a 28-foot-high dam creating a 37-acre reservoir above the falls. Two power plants below the falls would produce a total of 6.5 kilowatts of electricity. Kauai Electric's current generating capacity is 96 kilowatts.